Across the country, no land compensation are being paid by the Indian Army except in Arunachal as special case- Pema Khandu. The third leg of Arunachal Rising campaign led by Chief Minister Pema Khandu and accompanied by MoS Home Kiren Rijiju was launched here today in presence of MLA Paknga Bage, MLA Punji Mara and other dignitaries. 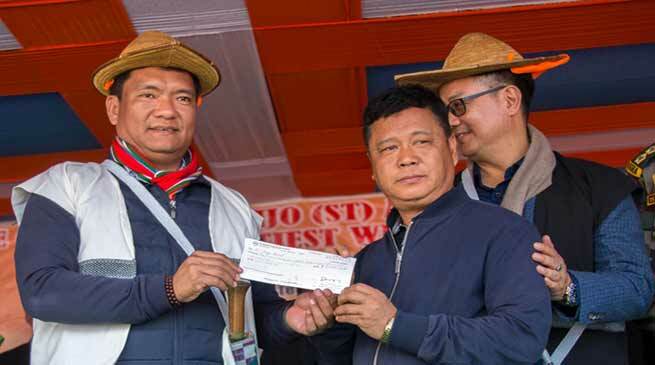 Chief Minister on the occasion distributed land compensation cheques worth Rs 53 crores for the land acquired by the Indian Army at Bora Ropuk village. Distributing the cheque to representatives of 47 families identified as the beneficiaries, Chief Minister thanked the role of MoS Home in expediting the land compensation within short time. He said across the country, no land compensation are being paid by the Indian Army except in Arunachal as special case. Responding to a public memorandum for recruitment of porters in Indian Army and other jobs for locals, Chief Minister assured to discuss the matter with the Army authorities. Chief Minister appealed the people to maintain harmonious relation with Army, paramilitary forces. He said Tawang people has benefitted enormously with such relations and thanked the locals for giving away their land for defence establishments. He suggested that a festival celebrating the civil-military friendship can also be celebrated here as it is celebrated in Tawang and West Kameng district. Chief Minister further spoke on the achievements made so far by the state in the last two years. He also spoke on the objectives of Arunachal Rising campaign and the benefits of Sarkar Aapke Dwar being conducted across the state.